Delphi CEO J.T. Battenberg III settled on payment terms with GM but didn't find out about the accounting treatment until later, his lawyer says. DETROIT -- During a tense September 2000 meeting on the 38th floor of General Motors headquarters in Detroit's Renaissance Center, GM purchasing czar Harold Kutner delivered a blunt message to Delphi's top executives. Months into a bitter standoff, Delphi's top brass continued to deny they owed GM $250 million for recalls involving faulty parts made while Delphi was still part of GM. Kutner threatened to choke off new business if the supplier didn't cave. That's the story Delphi's top lawyer at the time, Logan Robinson, relayed to jurors at former Delphi CEO J.T. Battenberg III's securities-fraud trial. Robinson, the highest ranking former Delphi official to testify so far, said Kutner warned him that Robinson was "calling into jeopardy Delphi's ability to do business with GM" if he didn't back down. (Kutner declined to comment for this story). Through four weeks of testimony in the civil trial, a parade of former Delphi insiders, lawyers and accountants has cast GM as a bare-knuckled negotiator that set up Delphi for failure after its 1999 spinoff. The 10-member jury will decide whether Battenberg cooked the books in order to hit profit targets, as the Securities and Exchange Commission alleges. Whatever the jury concludes, the testimony so far offers a rare window into the intense friction between what were then the world's largest automaker and supplier. It also spotlights problems besetting Delphi as it sought firm footing as a new company before stumbling into bankruptcy in 2005. GM's warranty demand was the biggest point of tension, eliciting palpable ire from former Delphi officials even a decade later. Robinson referred to it as a "life-or-death issue" for Delphi. GM sent Delphi out the door with a tidy $53 million reserve to pay future warranty claims -- then a year later demanded up to $800 million for faulty parts Delphi supplied before it split from GM, witnesses have said. Meanwhile, GM was failing to live up to its own targets for purchases from Delphi at the time of the spinoff, instead steering a larger-than-forecast amount of business to other suppliers, Robinson said. "Delphi was literally at the mercy of GM," Battenberg's lawyer, William Jeffress, told the court. During the summer of 2000, three meetings between Battenberg and top GM executives led to a deal: Delphi agreed to pay $237 million to settle warranty claims and "certain open issues," including spinoff-related pension and benefit costs that GM was stuck with but which should have been covered by Delphi. How that $237 million payment was accounted for on Delphi's books lies at the heart of the government's case against Battenberg. The SEC contends the payment should have been recorded as a warranty expense, all of which would have come out of its net income that quarter. Instead, Delphi booked $202 million as an adjustment to pension expenses, spread over many years, thus inflating its earnings. Battenberg is accused of fraud for his role in the GM settlement and for signing allegedly fraudulent SEC disclosures. GM, meanwhile, booked the entire $237 million as revenue. That allowed GM to meet its earnings target -- barely -- for that quarter, defense lawyers said. Several witnesses, including Robinson and lower-level managers, accused GM of strong-arming Delphi under the guise of warranty claims in an effort to pad its own profits. "This always was just a number GM was trying to achieve," Robinson testified. "At a certain point, it didn't have anything to do with warranty." With the jury out of the courtroom, Deborah Kovsky-Apap, a lawyer for Battenberg's co-defendant, former Delphi chief accounting officer Paul Free, even used the word "extortion" to describe GM's tactics. The SEC says Battenberg should have known he would be on the hook for pre-spinoff warranty claims; the initial public offering disclosure that he signed says so. SEC lawyers have said pressure to hit earnings forecasts, whether created by GM or not, led Battenberg to cheat. But GM's tactics aren't on trial. U.S. District Judge Avern Cohn said whatever pressure GM might put on Delphi, either in structuring the spinoff or afterwards, is irrelevant to the charges against Battenberg. "I don't think how GM set up Delphi and whether it did it on the cheap ... so that Delphi was born in a malnourished state, is arguably relevant," Cohn, 86, said last month with jurors out of the courtroom. "I'm not aware that, if you pay blackmail, you can disguise it as another kind of payment." Defense lawyers said that because the warranty claim was flagrantly outsized, it only made sense that GM would open the final settlement to other issues, including the pension matter. At the time, witnesses have said, Delphi executives were concerned that GM eventually would demand to be reimbursed roughly $200 million for pension and health care costs for thousands of workers who joined Delphi upon the spinoff but later flowed back to GM. "Neither J.T. Battenberg nor anyone else at Delphi believed that Delphi owed GM $237 million for those warranty claims," lawyer Jeffress told jurors. Nicholas Difazio, Delphi's lead outside auditor in 2000, said GM was notorious for demanding big payments from suppliers and negotiating down. "GM asserted very large, puffed-up claims ... and ultimately settled for very small amounts," he told jurors. Much of the criticism of GM was challenged by Harry Pearce, GM's former vice chairman and general counsel, the only GM executive to testify so far. 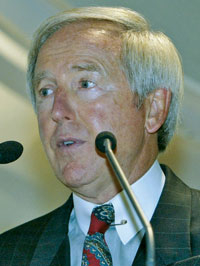 Pearce, 68, now is chairman of MDU Resources Group Inc., an energy and infrastructure company in Bismarck, North Dakota. Pearce said the $237 million was a warranty payment resulting from a careful engineering review by both companies and "had nothing to do with GM earnings." He also denied GM ever yanked business from Delphi because of the warranty fight. "I wanted Delphi to be in good financial position," he said. "They were GM's largest supplier. We cared about Delphi."